In their fifth World Cup game, Argentina recorded their fifth one-goal victory. Alejandro Sabella was without Marcos Rojo so brought in Jose Basanta at left-back, and replaced Federico Fernandez and Fernando Gago with Martin Demichelis and Lucas Biglia. Marc Wilmots played Kevin Mirallas rather than Dries Mertens on the right flank, but otherwise the side was as expected. Belgium remain a group of individuals, while Argentina play to the strengths of one individual. In a rather slow game, the main tactical point of interest was the Belgian midfield zone, and their battle against Leo Messi. In Messi’s previous game, he’d been up against two Swiss central midfielders who double-marked him throughout, in the belief that if you stop Messi, you stop Argentina too – they weren’t far wrong. Belgium had a more relaxed approach. 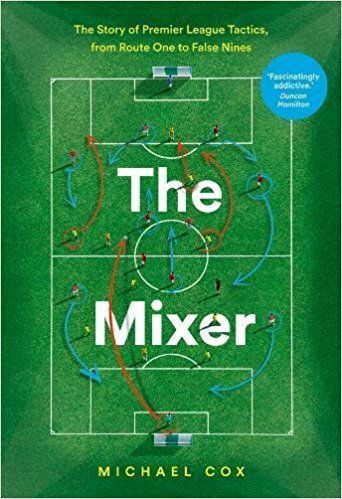 Axel Witsel was the deepest midfielder, but Marouane Fellaini had plenty of license to move forward and join Kevin de Bruyne higher up – particularly when challenging for long goal kicks, when he became a second striker. This fluidity made the midfield zone very open, and Messi had plenty of space. Another interesting factor was how the Belgian centre-backs moved up the pitch, with and without possession. They stuck tightly to Gonzalo Higuain when he dropped into deep positions, in stark contrast to the manner the French centre-backs let Miroslav Klose drift up the pitch unmarked the previous day, for example. Kompany also moved up the pitch shortly before Higuain’s goal, being dispossessed by Messi. He had enough time to recover his position, and it was a fortunate deflection that took the ball to Higuain – and a brilliant strike into the far corner. 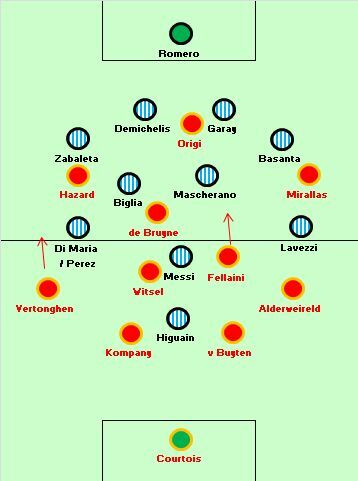 Still, it shows how Belgium were being risky with the positioning of their centre-backs and central midfielders against Messi. Messi instigated most of Argentina’s attacks, but the crucial feature of his performance was how he calmed the pace of the game, holding onto the ball and allowing opponents to get goalside before delivering penetrative through-balls from deep positions. The best example was his brilliantly measured ball to Angel Di Maria, perhaps the pass of the tournament. This is an Argentina side based around Messi, and therefore Messi’s reserved approach to attacking means Argentina’s tempo has been transformed from the qualifiers, where they tended to break quickly and bypass the opposition defence immediately. The transformation has been significant, with Argentina becoming more classically South American rather than a European, and Messi becoming a more typical Argentine number ten. Sabella was forced into an early change after Di Maria limped off with a tournament-ending injury, and Sabella’s decision to use Enzo Perez in his place was good demonstration of his mindset – Perez is a defensive-minded midfielder more at home in Biglia’s role. With Argentina ahead, Sabella was happy to defend. He was also concerned about the forward running of Jan Vertonghen, who enjoyed a good tournament in his unfavoured left-back position. He made some good off-the-ball bursts and whipped in some dangerous crosses too. It made sense to summon Perez up against him, although he wasn’t actually very effective at stopping the crosses. Logically, he attacked much less than Di Maria. Argentina were happy to kill the game, and the focus was therefore on Belgium to stage a fightback. Throughout this tournament, Belgium have looked much better towards the end of matches, generally having introduced substitutes. Wilmots has received some praise for this, but it’s not as if his substitutions have significantly changed the shape of the side significantly – it’s just about introducing fresh legs. Belgium’s overall strategy still remains highly questionable, but more than any other side in this competition they have back-ups of a similar standard to their first-choices, and therefore they’ve received significant boosts late on. The same thing happened here – Mertens replaced Mirallas, Romelu Lukaku replaced Origi, but Belgium’s formation remained the same. Later, Nacer Chadli would come on for the ineffectual Hazard. The key in Belgium’s strong spell towards the end of the game, though, was the fact they became more direct. Rather than trying to find De Bruyne in pockets of space or get Hazard running at defenders, they played a much simpler strategy. Fellaini moved upfront more regularly and caused problems in the box, getting his head to a couple of crosses (although giving away too many free-kicks). Vertonghen continued to be a threat on the left, while De Bruyne went right and crossed. Belgium also hit long balls – one late De Bruyne half-chance was simply because Fellaini was acting as a target man. There was nothing clever about the approach, but it caused Argentina problems and resulted in Belgium’s best period. They are, while clearly technically talented, primarily an extremely strong, physical side – with four centre-backs along the backline, plus Witsel and Fellaini in midfield, and Origi or Lukaku upfront. A more simple, physical game plays to their strengths. Argentina were super-defensive in the second half – Rodrigo Palacio replaced Lavezzi, a straight swap, but then Fernando Gago came on for Higuain, meaning Argentina were now a 4-5-1 system with four solid defenders, four holding/defensive/central midfielders, then Palacio running forward from the left and Messi upfront alone. 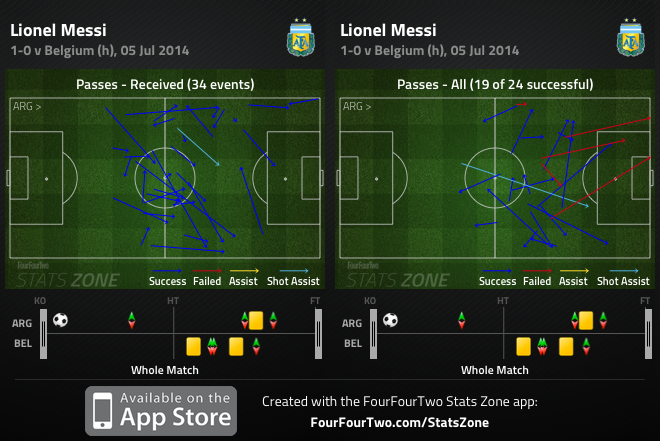 In fairness, the latter two created the best chance of the second half, a one-on-one for Messi in stoppage time. This game confirmed the suspicions about both sides – Belgium don’t know their best XI but are good at rallying late on, while Argentina increasingly play to Messi’s strengths, especially without Aguero and Di Maria. His strengths, however, are different with Argentina compared to Barcelona. Belgium’s tournament has been labelled disappointing, yet it’s roughly what should have been expected. In fact, they’ve overachieved slightly by reaching the quarter-final stage. Only in one game have they looked impressive – against USA – and even then, they had a major problem converting promising moments into goals. They’ll be stronger for Euro 2016. Argentina march on – or should that be ’stumble on’? They’re still yet to play well despite facing mediocre opposition, but they’re getting the job done – and there’s every chance Messi could drag them to glory. “They’ll be stronger for Euro 2016.” – I think they need to replace Wilmots, he could not build a team from the individuals as you have rightly observed. These lads would be in the semis with a van Gaal figure on the bench. Argentina looked very well drilled in defense, the number and manner of offsides may pose a problem for the Dutch, who were caught off a high number of times against Costa Rica. I was surprised Belgium played such a proactive game. They tried to dominate possession and play a fluid midfield three, against an Argentina side that loves breaking into space and has the world’s best attacker. But even more so, they aren’t really suited to that sort of game. Kompany is a great penalty box defender but distinctly average when playing high up the pitch. The fullbacks are really CBs so can play in narrow positions comfortably. Witzel and Fellaini could have concentrated on messi as every move went through him, while Witzel has the ability to play more direct balls into attack from deep. Finally hazard and mirallas both prefer breaking onto space in behind the fullback. They were still the underdogs and forcing Argentina to come out and play could have exposed their defence. I think people are too harsh on Argentina and Sabella for that matter. For stumbling into the semis, they’ve managed games and have managed to minimize their weaknesses rather than over-capitalizing on their strengths. Sure they could operate a high line but that’d be suicidal. Sure they rode their luck against Switzerland but this was their most composed display defensively against a team with several weapons. What was it, 1 shot on target by the Belgians? A lot of the criticisms leveled at Argentina about being over-reliant on Messi can be leveled at the other teams in the semifinals. Germany maybe less so, but a lot of their play gets channeled through Kroos. Even with Kroos, Germany seems to be benefiting more from set pieces rather than open-play attacks. The Dutch go exclusively through Robben to transition and Brazil were going through Neymar, it remains to be seen whether they can get similar production from other stars particularly against Germany now. Finally, some sense… Argentina have been excellent defensively, even more so than Brazil, I would say, and against comparable, though, indeed, slightly weaker opposition (Nigeria, Switzerland, Belgium are pretty good sides, albeit perhaps not quite as good as Colombia or Mexico – not a fan of Chile in this World Cup, solid as they were, the World Cup version of Simeone’s Atletico). And they’ve not been too bad at all in attack either. Argentina have a great chance to win this (I know it might seem irrelevant, but it’s been 9 years since Messi’s debut for the national team (2005) and it was also 9 years from Maradona’s debut until he won it in ‘86) and I stand by my pre-eightfinals prediction that they will beat Brazil in the final. I would be a bit surprised if any of the other two won it (they seem a lot less solid defensively and also mentally, I would say), although I would be happy for them if it was Holland, as I’ve always been a huge fan of both Robben and Van Gaal (and even Holland in general). I agree with you regarding Argentina’s defensive display. On the other hand it’s quite obvious Argentina hasn’t been tested at the highest level to this date, unlike Holland (vs Spain, Chile…), Germany (vs Portugal, France…) or Brazil (Chile, Colombia…). It’s an incognito how’ll manage against a “big” team to be fair. Also they’ve never had to chase a goal (they’ve always scored before their opponent) and I really don’t know how they would manage to do that without a creative midfield especially in the absence of Di Maria…tough call! Yeah, I know, that is a bit of a problem, the fact that they’ve not yet been behind. But I’ve seen controlled tournament wins like that in the past – if the team is good enough and solid enough (which it seems to me Sabella’s team is) and there are people who can score under pressure (there obviously are in Argentina’s case, Messi first and foremost), then they tend to get through it anyway when that moment does arrive, if ever. Italy in 2006 comes to mind – they were never behind until the final, but they had Pirlo who could always come up with something, and they managed to equalize (from his corner, I believe) and win it on penalties against a team that didn’t concede much at all, Domenech’s France. One also inevitably thinks of Maradona’s Argentina in 1986, a team that also had a very strong defensive block. Starting with their third group match, they too were never behind (they drew their one game in which they were 1-0 down, against Italy, in the second group match) and won the competition rather convincingly, thanks to Maradona’s brilliance, but also their defensive solidity. Individual brilliance aside, Belgium is easily a better side than Chile and Colombia though – I wouldn’t say that this match was hugely entertaining (or that either team has really shown their best), but Argentina did prove here that they are able to beat an impressive team consisting of top class players. Only time will tell. On the other hand I totally disagree on Belgium being a better team than Chile and Colombia – it’s simply not the case. Either Chile and Colombia would have kicked out Belgium of the WC had they met, in 9/10 games. Regarding going behind, well, as you say they simply might not. What happens with Argentina is that they plays with a very solid midfield (particularly the Mascherano-Biglia-Perez trio we saw against Belgium) which might nonetheless lack creativity and capacity of reaction in case Holland scores first. I’m also not sure about the quality of players coming from the bench (Maxi R. is descent for example, but nothing special). Of course this might not happen, precisely because it is a very solid trio which “veils” the potential deficits of the back-line. I think Sabella is really doing what he can with the players he has – and I do think he’s unjustly attacked on that. On the other hand, comparing this team with Italy 2006 is simply impossible: they had far more resources on the pitch and coming from the bench. They had both solid (Gattuso, De Rossi, Cannavaro)and very creative players (Pirlo, Totti, Del Piero to name a few) as well as great finishers (Toni and Inzaghi notably) – not even speaking about their goalkeeper, Buffon. This was a far more complete team (in fact one of the most complete teams ever in a WC). Whereas Argentina without Messi is not much. Well put! You’re right, Italy 2006 were a better all-round team. But Sabella’s team still resembles Argentina 1986 pretty well. Surely Wilmots must be one of the most disappointing managers at the tournament, if one compares Belgium’s play with the resources at his disposal. Better tactics could’ve won Belgium the match maybe, but player-for-player Belgium certainly isn’t a much better/worse side than Argentina. Unlike BEL-USA and CR-NED, this wasn’t one of those matches where a clearly inferior side holds out heroically until the very end, this was a match between equals that on another day could’ve easily fallen the other way – like ITA-ENG, URU-ENG, GRE-IVO, etc. This in the end was disappointing and frustrating for Belgium, but they did put up a good performance and I see little reason for them to change things too much. With a bit of patience (and luck, you need that) they’ll be contenders again in EURO 2016 and WC18. Both teams disappointing, just like the whole world cup. There just does not seem to be a single team that had convincing performances throughout the tournament. If I were an Argentina fan, I would be frightened by the fact how many almost chances Belgium created with a simple 2 target man up front and chipping the ball to them, and that despite having 9 defensive players on the pitch by then. The group stage was excellent, the round of 16 OK, and the quarter finals awful. the World Cup has been good but the Big teams haven’t been convincing. The best ‘Big Team’ were probably France or Netherlands, and since France are out I fully believe Netherlands can finally end their drought. meh, Holland couldnt score not even a single goal vs. Costa Rica during 120 minutes!!! Bad luck mainly – they hit the post once and the crossbar twice. But sure, CR was fairly effective defensively. 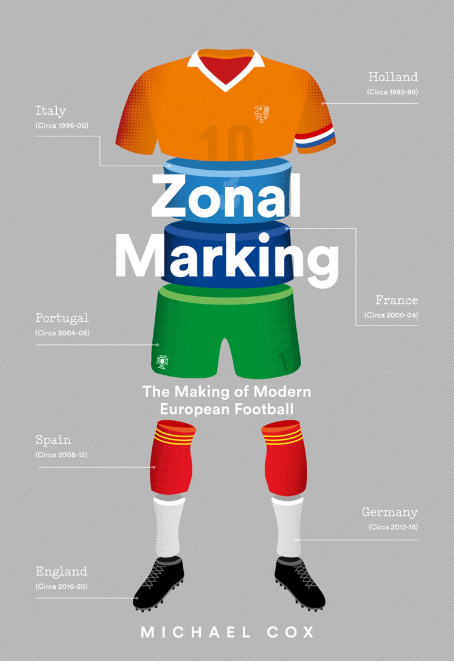 Netherlands have recently been a counterattacking side, and have had some problems scoring against defensive opponents. That said, I do agree the Dutch haven’t been all that convincing either. It’s true that the Dutch were not so convincing so far. Then again, the “Oranje” reaching the semis is already quite an overachievement considering how inexperienced their team is. Just look at how many of their starting 11 are between 22 and 24. They should be strong in 2 and 4 years. And they have so good players injured, too, like Strootman, Van der Waart or Van der Wiel. as an argentine fan I actually was very happy with this performance. Effective, professional, organized and mature. I am surprised ZM did not mention Higuain’s tireless work on the pitch creating movement on and off the ball,coming deep or keeping Kompany busy high up and showing how to play the lone striker role while also discovering some of his ruthlessness. In a previous post (swiss match) I had mentioned gago’s spot was most concerning. With the introduction of biglia this seems to have stabilised the spine bringing out the best in mascherano who, like mentioned below played like a beast, again I am surprised at no mention of his marshalling of the defense. El fideo will be missed and is irreplaceable from the bench but perez subbed ably and showed potential to keep up more pressing wing work if required (not required in this match). Truthfully this bit about a belgian comeback/fight back seems to me to be an overstatement. I mean the 3 minute swiss comeback had more venom and struck more fear in me than the 80 minute belgian comeback! At around the 65th minute (could be wrong here) or so I think Fellaini had that bullet header but I think romero had that angle covered. The only real chance after that was the closing tough shot by witsel 30 minute later. The rest of all these ‘deadly chances’ were thwarted by a well held off side line, impatient belgian fouls or the odd handball or two. Nothing really dangerous in the box. There you go… And yes, Belgium created less real danger than Switzerland, for sure. Their change of approach was correct, but their executions less so and, of course, the Argentines defended well. Now this is the Argentina we want to see. Using possession as a defensive weapon fantastically well. Two clear banks of 4 when defending. This is Messi’s tournament. If only he could come to Italy he would be the greatest trequartista Italian football has ever seen. Unless my eyes really deceived me Mascherano did far more work than Messi. Belgium created so many chances versus the US and barely even shot at Romero (thank god). Pretty amazing how one player could make this otherwise weak defense look so strong, but as always flashy attacking players will get the headlines it seems. yep I thought Mascherano was an absolutely beast. Argentina v Germany final with Argentina winning it. Messi golden ball and boot. So far the only semi final spot I’ve got wrong was Holland. I thought that would be Italy, otherwise this tournament has been pretty much to be expected. I expected Spain to progress instead of Holland. cox i should say your analysis is getting better . the best that you summed up the game in one sentence ” if you stop Messi, you stop Argentina too – they weren’t far wrong.” that is a good one . i think belgium just got over confident . they thought witsel alone can handle messi and they will push back argentina by having more players upfield . witsel didnt do a bad job but that job took time . forget about belgians defending but on the attack they really dont have any plan . argentina were going to play deep . against the pace of origi both demechellis and garay didnt had any chance . argentina’s discipline was very good .there was no space between the lines to work on and credit to sabella for dropping hopeless gago . biglia was another good performer in the middle of the park . even his distribution was also very good . now there was no space to work on back and no space to work between line the best option begian had was to throw crosses and from those only two of the best belgian chances came to them . wilmots didnt seem to understand this .why did fellaini start was beyond my understanding . he is hopeless . he is neither a midfielder, nor a no.10 and nor a forward . why didnt he start dembele who is very good . to be honest argentina didnt beat them but belgians lost because of wilmots stupidity . would any club want to sign him as a manager . i dont think so . except that to keep Messi relatively quiet you need to commit 2/3 players on him, one is definitely not sufficient. And when you do that you open space for other players. So the tactical question becomes: who are those players that can exploit the space left to mark Messi? If Aguero is fit and Higuain plays well, I think the answer is obvious. Hugely disappointed Belgium, bunch of individuals. The free kick taken by Mertens in the second half tells it all. Belgium was threatening with crosses, this free kick was in the best possible zone for crossing (Germany scored against France from simillar situation), but Mertens went for personal glory. Then the mess of Wilmots. Fellaini in the box was his plan B, but Fellaini was even at the end of game in defensive formation playing in CM. He was all the time running up and down and coming in the box too late sometimes. Maybe simple change to 4-4-2 could have helped (it did against Algeria). One of the wingers off, another CM on and Fellaini playing as second striker. Why not trying with de Bruyne at RB for the last 15 minutes? Comparing to Alderweireld he’s much better when under pressure, when attacking and at crossing. At the end it felt as Wilmots had an idea for plan B (use the height of Fellaini and others in the box) but didn’t take the right tactical decisions to make the most of it. That’s what I observed about Belgium, too- individuals who did not know how to play together. They’d attempt 1-2 passing to a player who was moving in a different direction, kick a ball down the wings to a player who wasn’t making a run. They just weren’t on the same page, and made unforced error after unforced error. It was far more about Belgium being wasteful than Argentina making it difficult, and I find it hard to find much to praise in Argentina’s performance. The Netherlands and Germany are the best organized teams at the tournament. If Argentina plays as they did against Belgium, I expect them to be picked apart, with only Messi brilliance being able to keep the game within distance. Argentina, clearly, had a plan that was to win without tiring, having played all their games barr one, at the first spot. They controlled it well and didnt open out their defence like all expected. Even Messi, a natural attacking player, controlled his surge to attack and slowed down the play. For once, the whole team did well as a team. If this was done by England, they will never do, then ZM would have explained it differently I am sure.